The couple appear to have parted ways. Amber Rose appears to have confirmed that she has broken up with Atlanta rapper 21 Savage. Despite recently denying strong rumours about the split, the model seemingly broke the news during an interview with Big Boy’s Neighborhood in the US. “I love him, I really love him, and I miss him, I think about him every day,” she admitted. “I can’t say that I’m single because, in my heart, I still love him. Rose then confirmed that they were going through a very “rough patch” but insisted that she hoped they would be able to reconcile and get back together. She also confirmed that although they have split, their children are still friends and the pair still talk “a little bit”. The model then opened up on how the price of fame weighed heavy on their year-long relationship. “To be in a relationship, in general, is very difficult. To be famous and in a relationship, it’s even more difficult,” she said. During the interview she also addressed critics who were homophobic about her 5-year-old son because he was a fan of Taylor Swift. 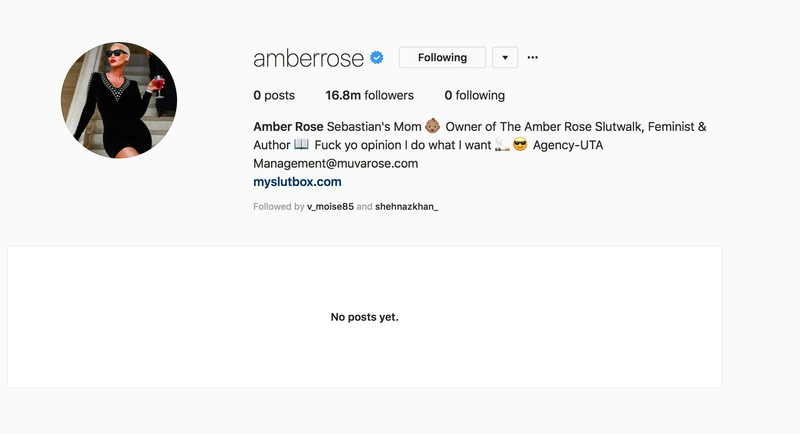 Interestingly, Amber Rose appears to have deleted all the photos from her Instagram account and unfollowed everyone, following her interview.